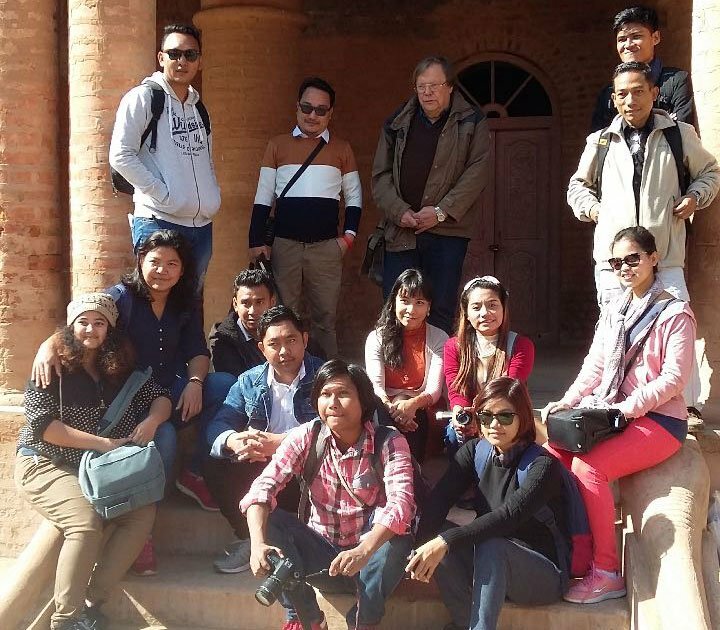 Journalists from various parts of Myanmar along with Bertil Lintner, eminent Swedish author posing for lensmen at Kangla Fort in Imphal on December 1, 2017. A team of journalists from Myanmar on a 10 day study tour in India’s Northern Eastern states bordering Saigang division in Myanmar said India should be proactive and take up similar initiatives like China in Myanmar to strengthen the relationship between the two countries. Aung Htun Oo along with 12 other journalists from various parts of Myanmar toured Assam and Manipur and was also joined by Bertil Lintner, eminent Swedish journalist, author and strategic consultant who has been writing about Asia for nearly four decades. Another group of journalists from Myanmar are on tour in China. For the first time we are seeing such cross-border training in India after our earlier cross-border training experience in Thailand, he said. “Our country has many ethnic groups and minorities. So, we also want to know how the Indian government handles ethnic groups in their country. We have learnt a lot about North East India this time, and it is very interesting to visit places like Guwahati and Imphal. This is an eye-opening but introductory trip,” Aung Htun Oo added. Imphal is very important for Burmese because of battles between British and Japanese, and it even has a chapter in our books, the visiting the journalists said. Even though Myanmar has a new government, the journalists are still facing difficulties regarding collecting information as the military are still controlling things. After visiting Loktak Lake in Bishnupur district in Manipur, a team member said Loktak is similar to Inle, a freshwater lake in Myanmar’s Shan state where the lake dwellers row their boats with their legs etc. On the other hand, journalists who write for business wanted to know more about the status of the Indo-Myanmar border trade which started in April 1995. They even asked their Manipur counterparts to share their personnel views and expectations from the trade once the Integrated Check Post which is currently under construction is completed. At the same time, journalists in Manipur also requested the visiting Myanmarese counterparts to share the issues of environment and other development activities in Myanmar. During their stay in Manipur, the Myanmar journalists also visited Ima Keithel, the largest women run market in Asia and Kangla Fort both located in Imphal town. They also visited Moreh located about 110 km south of Imphal bordering Myanmar’s Tamu.